The first HGV to join our fleet, the Volvo FH460 8×2 Palfinger PK 62002 EH Cheesewedge Crane Lorry has been built to an extremely high specification with the latest safety features to ensure we go above and beyond the industry standard. This lorry has been designed to carry out a wide range of duties and be a swiss army tool when it comes to moving equipment and materials. 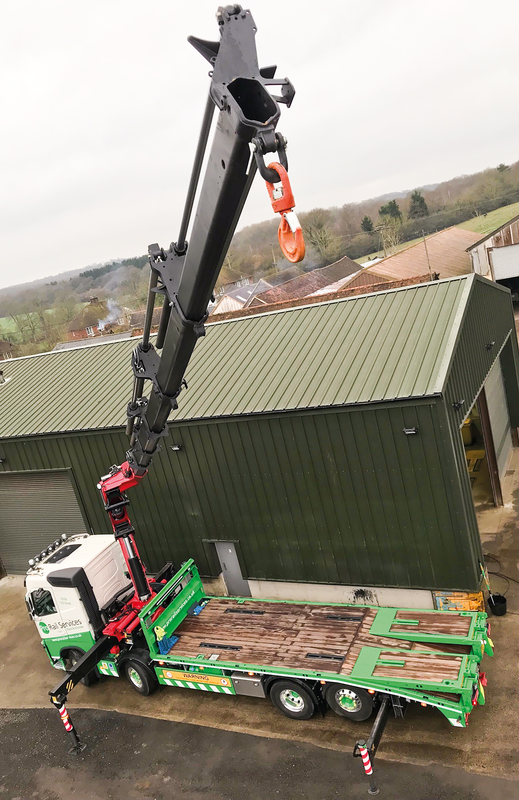 The crane which is fitted is the Palfinger PK62002E and has exceptional lifting capabilities. The Cheesewedge body on this lorry is where it outshines other vehicles matched in name. Fitted with folding ramps to enable the truck to act as a flat bed or work as a plant beavertail body useful for a multitude of projects. The deck of the lorry is fitted with timbers & has rail wheel guidance sockets installed for carrying RRV trailers, as well as ISO locks for cabins. Health and safety is key at Pro Rail Services, therefore we have installed Fall Arrest Bars/Straps and a side access ladder to allow the driver to climb on the back of the lorry for loading and unloading. This also is essential for securing not only our client’s materials but also our vehicles when on hire. Our lorry is fitted with the very latest telemetry technology provided by Plant-i Ltd., enabling us and our clients to have real time tracking information to show the exact status of delivery. To accompany our 8×2 we have a VGB coupler installed to enable us to tow our Twin Axle Chieftain Drawbar Trailer with a 5.5m long bed, which can carry an additional payload of 8200kg.